VANCOUVER, BC / ACCESSWIRE / July 30, 2018 / Margaret Lake Diamonds Inc. (TSX.V: DIA / FSE: M85) ("Margaret Lake" or the "Company") reports the outcome of its 2018 spring exploration programs at its 60% owned Diagras property ("Diagras") and 100% owned Margaret Lake Property (the "Property") in the Northwest Territories. Both projects were funded in part by significant grants from the Government of the Northwest Territories (GNWT) Mining Incentive Program (MIP). The Company would like to thank the GNWT for their support and recognition of the potential for these quality exploration programs. Exploration at Diagras consisted of Gravity, Magnetic and Electromagnetic (EM) ground surveys focused around historically identified kimberlites as well as other airborne geophysical anomalies with kimberlite like signatures.This groundwork is designed to develop targets for a spring 2019 drill program. Diagras is a contributing Joint Venture (the "Joint Venture") between Margaret Lake, which acts as project operator and holds a 60% interest, and Arctic Star Exploration Corp. (TSX.V: ADD) which holds a 40% interest. Diagras is located in the prolific Lac de Gras diamond field just 35 kilometers from the world-class Diavik diamond mine. The Property lies directly on trend with the Diavik deposits currently being mined by a joint venture between Rio Tinto and Dominion Diamond Diavik. The Diagras land package consists of 18,699 contiguous hectares of mineral claims containing 12 previously identified kimberlites. Field work was completed by Aurora Geosciences Ltd. (AGL) and Initial Exploration Services Inc. (IES) between May 27 and June 6, 2018. The surveys targeted kimberlite intrusions and were designed to investigate areas proximal to known kimberlites as well as explore new target areas. Warm temperatures during the time of the surveys caused a rapid snow melt and flooding of the ice covered lakes. The conditions forced a premature end to the program leaving some of the planned target areas untested. This work is planned to be completed in 2019. A total of 133 gravity stations, 152 line kilometers of magnetics and 11.2 line kilometers of OhmMapper survey were completed. Of the surveys conducted this year, DG007, HL02 and Suzanne have emerged as interesting, drillable targets, showing evidence of multi-phase kimberlite complexes. At Suzanne, a combined EM and Gravity anomaly distinctly breaks a diabase dyke, with a separate magnetic low to the south. The Company has not located the previous drill holes, but it is likely they targeted either the EM or the magnetic anomaly, but not both. The anomaly is large enough (250m) to deserve more than one drill hole to search for different phases. At HL02, two long angle holes from the shore line (the anomaly is in a lake) were targeted and completed within this kimberlite by the previous explorers. The magnetic signature in this area is complex, suggesting the possibility of untested phases. The partly completed EM survey conducted this year shows an EM anomaly associated with the kimberlite but not tested directly by previous drilling. At the DG007 anomaly, previous explorers targeted a "classic" Lac de Gras, magnetic and EM anomaly. Two holes were drilled but failed to explain this anomaly, intersecting only granite. One of the drill collars has been found in the field and its position is displaced from that reported in assessment files, possibly due to GPS errors. Drilling to properly explain this target, which the Company believes is likely to be kimberlite, is required. The Joint Venture was also successful using this strategy during the spring 2017 exploration program. This work revealed gravity and EM anomalies proximal to known magnetic kimberlites that constitute compelling drill targets. At the Jack Pine kimberlite, which is one of the largest kimberlite complexes in the Lac de Gras diamond field (over 1.5km in its longest dimension), the geophysical methods (ground gravity, EM and magnetics) highlighted obvious magnetic kimberlite phases drilled by previous explorer De Beers Canada while also successfully defining a new kimberlite-like geophysical expression, in the form of coincident gravity and EM anomalies. At the Black Spruce kimberlite, a series of gravity lows occur adjacent to the south of the known magnetic phase of the kimberlite. One of these gravity anomalies clearly breaks and disturbs a diabase dyke, a common characteristic of many Lac de Gras kimberlites. The Company now has drill targets with high potential to discover new kimberlite or untested kimberlite phases in one of the best diamond addresses in the world, close to the operating Ekati and Diavik diamond mines. The Company plans to drill test the referenced targets as well as generate more targets through an expanded ground geophysical and drill program in Spring 2019. Intersected broken and altered granite. 17m Overburden, altered broken granite, minor granite breccia, mafic dyke. The altered and broken granite at targets ML-06 and ML-07 could indicate proximity to a kimberlite intrusion as similar conditions are observed in proximity to kimberlites elsewhere on the Slave craton. The ML051 gravity low anomaly is probably explained by the deep overburden. ML-07 and ML-08 targets geophysical signatures were not explained by the drilling. The company also has a portfolio of untested targets remaining. The drilling campaign was greatly aided by utilizing the Kelvin Camp operated by AGL and owned by Mountain Province Diamonds on the Kennady North project. The opportunity to use this facility saved the company from building its own accommodations, for which Margaret Lake Diamonds is truly appreciative. The Company plans to put exploration on the Margaret Claims on hold for the immediate future to concentrate on the Diagras property. The mineral claims are in good standing and can be re-visited in the future. The technical data in this news release has been reviewed and approved by Mark Fields, P.Geo., a Qualified Person under the provisions of National Instrument 43-101. About Margaret Lake Diamonds Inc.
Margaret Lake Diamonds Inc. (TSX.V: DIA) is a diamond exploration company focused on the Northwest Territories, Canada with two exploration properties. The Margaret Lake project is adjacent to Mountain Province Diamonds Kennady North project and in close proximity to Gahcho Kué, the newest Canadian diamond mine owned by De Beers and Mountain Province Diamonds. 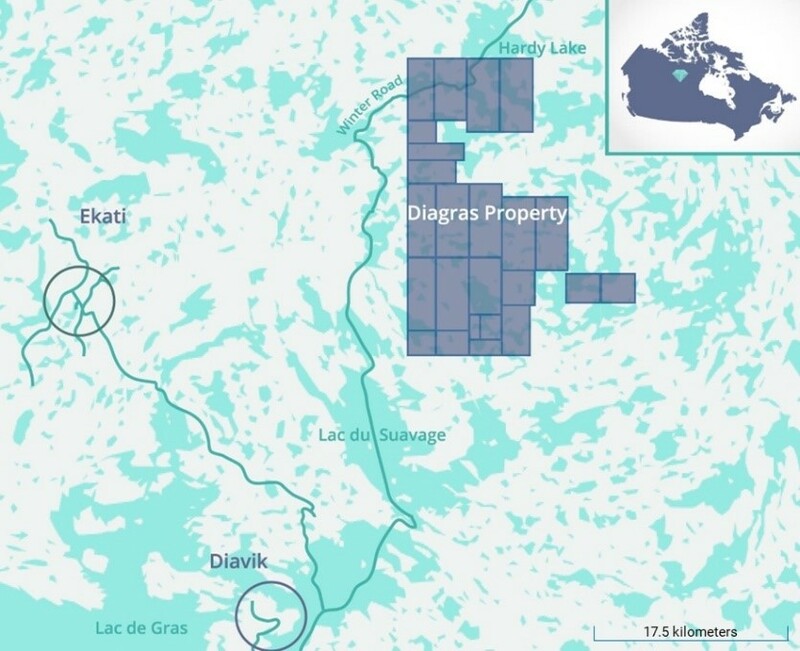 The Company also has a 60/40 joint venture with Arctic Star Exploration Corp. (TSX.V: ADD) to explore the Diagras property, which is comprised of 23 claims totaling 18,699 hectares located in the prolific Lac de Gras diamond field. This news release contains forward-looking information that involves various risks and uncertainties regarding future events. Such forward-looking information can include without limitation statements based on current expectations involving a number of risks and uncertainties and are not guarantees of future performance of the Company. Actual results and future events could differ materially from anticipated in such information. These and all subsequent written and oral forward-looking information are based on estimates and opinions of management on the dates they are made and expressed qualified in their entirety by this notice. Name: Margaret Lake Diamonds Inc.